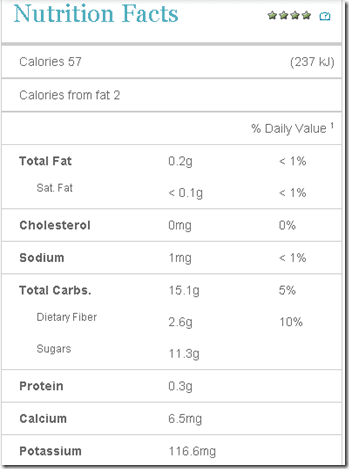 The other day someone asked in the comments how many calories and grams of sugar are in a serving of watermelon. Off the top of my head I knew it was about 50 calories per cup, but wasn’t sure about the sugar. 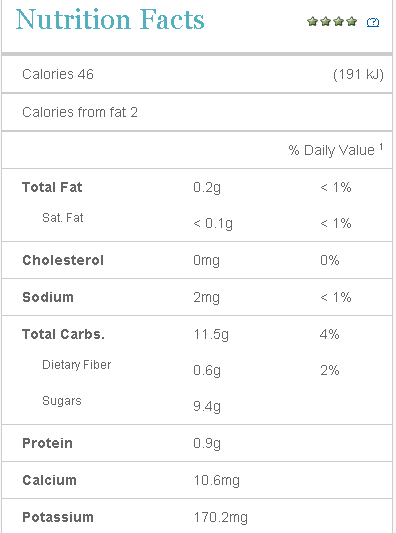 For reference, 1 cup of apple has 57 calories and 11.3 grams of sugar. 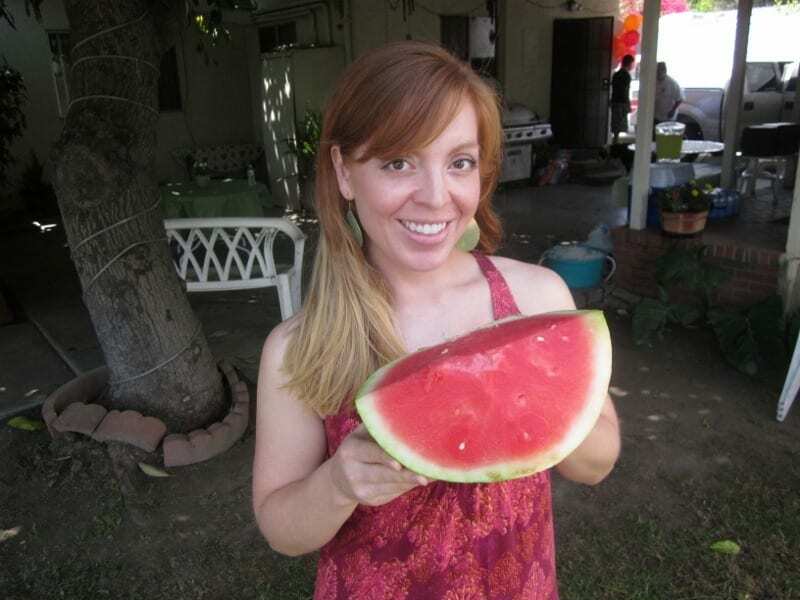 But, what’s more relevant to my situation is – how many calories are in a Whole Watermelon? 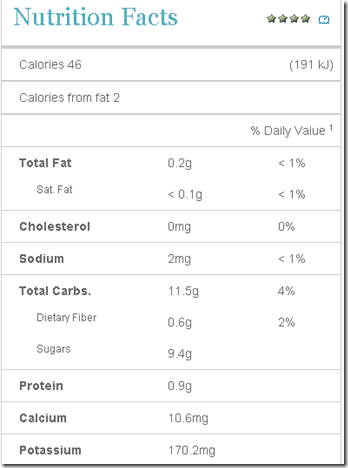 Again thanks to Calorie King, we can estimate there are 1355 calories in one 9 pound watermelon*. Good. 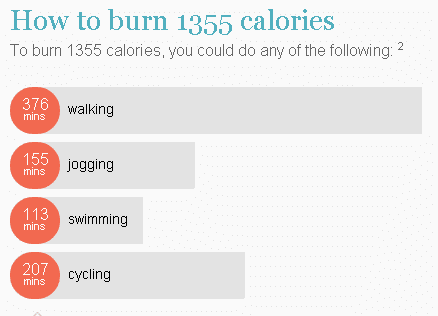 So, I can burn off one of these suckers with 2 six mile runs and a walk. Totally worth it. *Although, I try to buy the BIGGEST H2O melon from Costco so the ones I get are probably bigger. A reader sent me this video today. I know I’ve seen it before though… Like when I look in a mirror. I’m trying to lose a stone on a diet which allows me to have any fruit in any quantity. 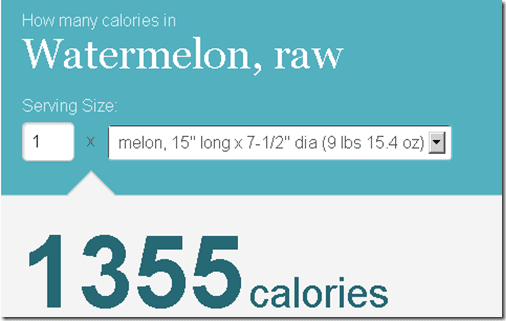 I’ve been tucking into the water melon every day and am horrified at the amount of calories in it! However, I bought another one today at a local market. Will try not to cut into it till tomorrow and save some calories today. Oh dear!! I’m keeping summer alive even now!!! Ate a whole watermellon throughout today and my daughter just had a small bowl of it. I did let my dogs have small pieces. LOL!!! Hahaha! LMAO! 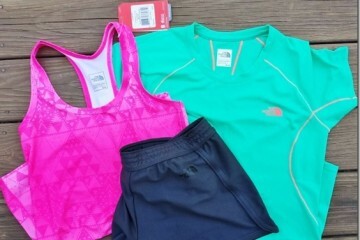 Tha’s awesome! Thanks for answering my question…you went ALL out!!! That’s great!! You made my day. 🙂 I swim about three days a week for 90 minutes. 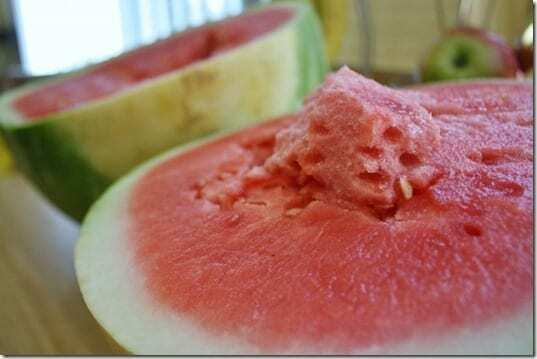 I’ll call those my watermelon days…. Wow, I have been know to eat an entire watermelon!! Yikes, this was eye opening!! 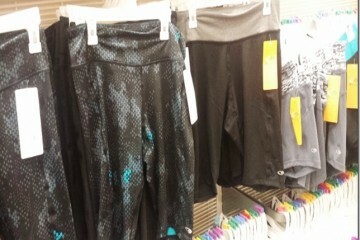 Well, they will be ou of season soon!!! I’m obsessed with watermelon too. The BEST post workout food! I miss watermelon, it’s totally worth the calories and sugar. 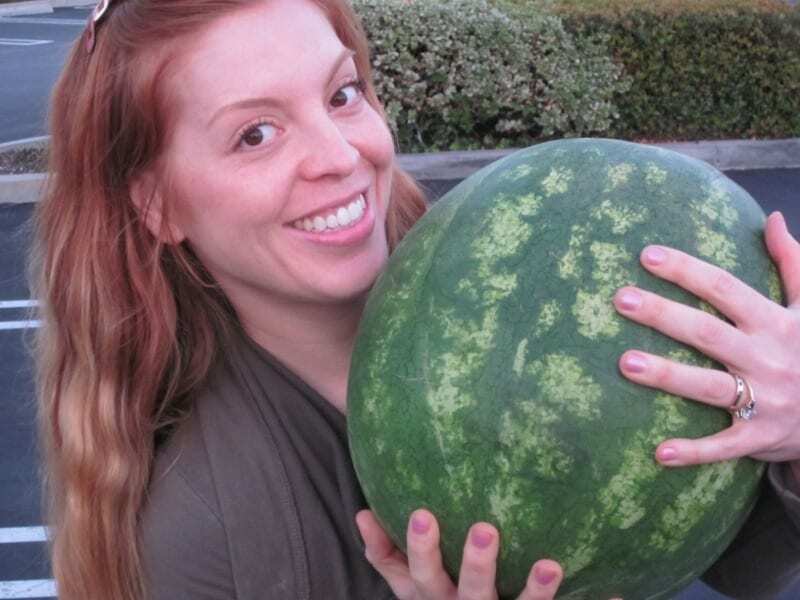 It’s a freaking watermelon, people. Just wish my system wasn’t so damn sensitive about everything. The video…it’s crazy. I can’t see it without laughing. Since I’m at work laughing at the screen, I might need to shut it down. Thanks for sharing!! You watermelon yourself enjoy every slurpy bite and have a great Watermelon Wednesday! Love that video!!! 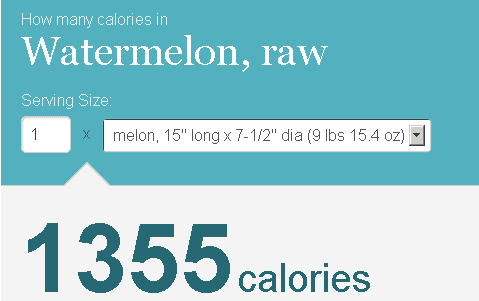 That’s a surprising number of calories in the whole watermelon! It is just so light and refreshing!! i am an entire watermelon eater too. 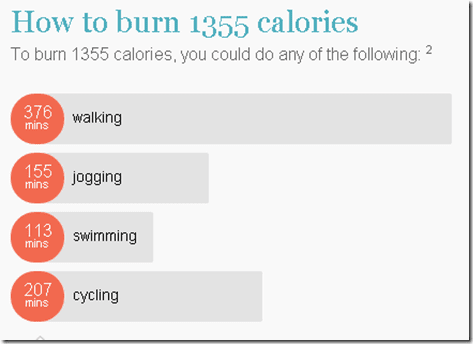 1355 calories – yikes! that video was awesome, thanks for sharing! Thanks for this post! I was wondering too since I’ve been eating a ton of watermelon lately, and ate a whole one in one day last week. Watermelon is a way better snack to binge eat than my cereal obsession. Just don’t eat the seeds…they grow in your belly! Duh! i am 67 years and DO eat the seeds!! ahhhh but we do love it huh? Do you and SR coordinate posts????!!!! Coz she just put up something on fruits – what’s good/better and what’s not-so-good (not that the fruit is “bad”…if you’ve a choice, pick something else or have less of it). I once read that Kenyan runners use watermelon to rehydrate, and some studies say it’s even better than water. Well I still want to eat to the whole thing … is that bad? I love watermelon! I used the technique from your video to carve one this evening. I can’t believe how much easier and quicker your technique is than my old one. Thank you for posting it! I’m going to play devil’s advocate for a second 🙂 Don’t kill me for saying this (although I am allergic to watermelon so maybe it’s because I just can’t fathom the magic), but I think if I were going to eat that many calories I’d want something with less sugar and more nutrients. I know it’s not like you eat one a day every day and there are FAR FAR worse things people could consume, but that much sugar just makes me nervous. What are your thoughts on the natural sugar angle? I do think sugar is sugar is sugar. But, I don’t eat watermelon because it’s a “fruit” or supposed to be healthy or something, I really just love it. I feel like I’m missing out. I don’t even remember how it tastes in it’s natural form. 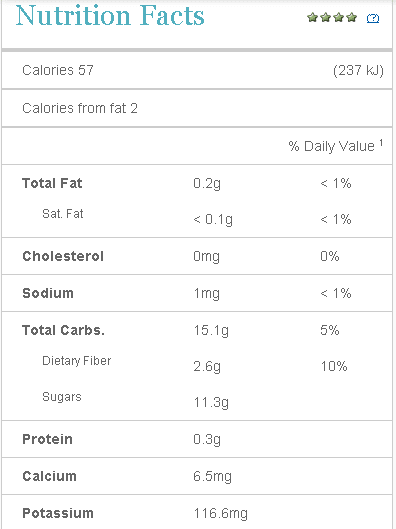 I was more surprised by the number of carbs in watermelon…I am it is mainly water right??? I think there are many other foods that are so much worse to each too much of! You could start a new fad diet where you eat one large watermelon per day, nothing else! I can deal with the calories. I mean, it’s the taste of summer! You can’t put a (calorie) price on that! Ok, you can. But still. Ha! Hopefully my blog never gets as popular as yours, because if someone asked me that I’d rudely say, “Google it.” But seriously, um…Google it. Haha! Totally worth eating the entire thing!